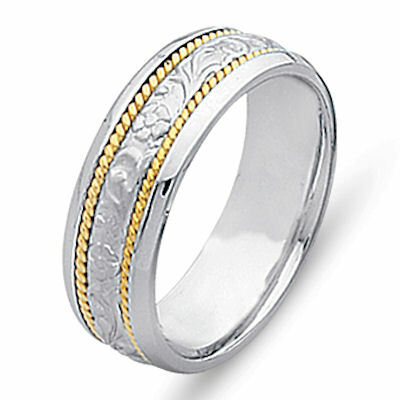 Platinum and 18 kt yellow gold hand carved, 6.0 mm wide comfort fit Celtic wedding band. The ring has hand carved platinum designs and two twisted ropes made in 18 kt yellow gold. The center is matte finish and the rest is polished. Different finishes may be selected or specified. Beautiful!!! It is exactly as I pictured it and advertised on here. I used the sizing kit from here and the fit is PERFECT. I was very happily surprised by this mens wedding band. I wanted a wider band for myself so I ordered the mens band. Its very comfortable to wear and seems like top quality. Beautiful ring just as advertised. Excellent customer service. I will definitely use this company again. This is an awesome website. Loved their band and the engraving was perfect! unfortunately my band got stuck with the customs here apart from that they shipped it on time. My husband loves his wedding band and feels its very comfortable.